Heber Parks was the first driver for the stagecoach line that eventually delivered guests from the rail line at Spadra, near Pomona, to the Glenwood, the pre-cursor of the Mission Inn. 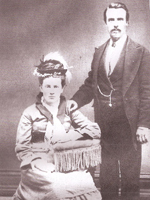 The Parks family immigrated to the United States from England after being recruited by Mormon missionaries. They arrived in the Inland Empire in 1855, after an extended stop in Utah. Heber’s father, Judge Arthur Parks, a Justice of the Peace, bought land from Louis Rubidoux. Heber purchased a part of his father’s holdings in 1884. Heber was hired to drive stagecoach because of his familiarity with the region, a result of his travels back and forth to attend college in Los Angeles. He picked up passengers in Spadra and went on to Rincon (Prado) before proceeding to Riverside and San Bernardino. On the return trip Parks would depart San Bernardino at 8 a.m. the following morning and reach Spadra at 4 p.m. The stage ran three times a week and cost $3. When the Millers arrived in the area in 1874, it was Parks that picked them up. The Santa Ana River happened to be flooding and Parks took the Miller family to his parents’ home in Jurupa to wait out the flood for the next week. Another special passenger ultimately became Parks’ wife. Ida Wallace and her sister traveled from Illinois by train, then boat to San Francisco then to Spadra, where Parks picked them up and delivered them to their father’s home in Arrowhead Hot Springs. A year later they were married on Ida 17th birthday. Heber was 27. The couple had nine children but lost the youngest girl one day after she was born and three sons were killed in freak accidents including an accidental gunshot wound, blood poisoning from stepping on a pitchfork hidden in a hay pile, and a neck injury sustained in a bicycle crash. As the rail lines were extended, the stagecoaches were no longer needed, and Heber stopped driving in 1874. He opened a grocery store in San Bernardino. In 1884, Heber was elected constable of Agua Mansa. He held other civic positions including registrar of voters, elections inspector, and school board member. In 1911, Parks purchased one of the first automobiles in the community, a Chalmers.